The sky was mostly sunny as people of all ages partook of all-things-railroad at the Glory Days of the Railroad Festival at White River Jct, Vermont, on September 9th, 2006. 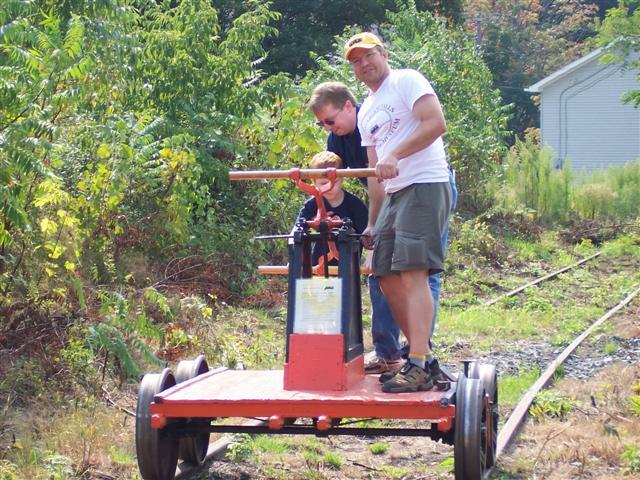 The Central Vermont Railway pumpcar, owned by the Shelburne Falls Trolley Museum was in attendance with help from SFTM members Carl and Kari. 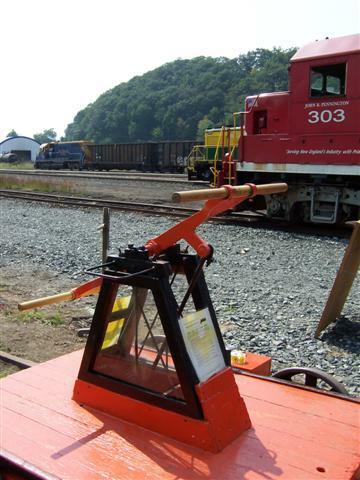 The SFTM pumpcar, the oldest operating piece of railroad equipment at the festival, provided a great turn-of-the-century hands-on experience for all. Smiles abounded on the faces of all those who dared to exert the effort to pump the handle of the car for a short ride down the isolated segment of track in the center of the wye trackage. The location worked out well, for, as many visitors boarded the Vermont Rail System excursion train they could see the SFTM display, and upon return, a stream of people lined up to take a ride. Adult visitors were very interested in the history of the car, many saying “I always wanted to do that, I’ve seen it in the old westerns,” while the young were more interested in making the car go as fast as possible! Many attendees gave donations to the museum and took the new informational SFTM rack card available on the SFTM display board. 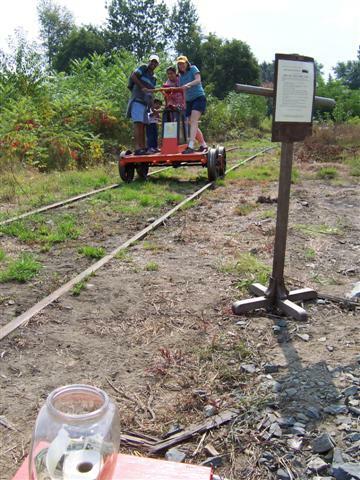 Complimenting the pumpcar at the festival was its successor in the historical progression of railroad track inspection—the motorized track car. A Fairmont MT19 of Canadian National Railway heritage, brought by the Cotton Valley Rail Trail Club, provided rides to festival attendees on an adjacent track. Static displays of New England Central, Claremont Concord, and Vermont Rail System diesel locomotives and Rutland passenger cars, as well as vendors of model trains and railroad-related items were present. A great day was had by all and a few more people were informed about the Shelburne Falls Trolley Museum—hopefully we’ll see some of these new fans soon at SFTM!